Hoopfest site manager Rob Davis spends months prior to the event prepping the hoops. Rob Davis and his team are efficient on the basketball court. Not with their ball movement or free-throw percentage. The Hoopfest site manager and his crew's efficiency lies in actually making a basketball court. On the Friday of Hoopfest weekend when the 9-to-5ers leave work to head home, not much appears out of the ordinary in downtown Spokane. This year is a little different with the addition of the pre-tournament festivities near Riverfront Park, but by and large, the city looks as it should. Then, somehow, merely hours later, 42 city blocks have been closed off, cars replaced by basketball courts. The largest three-on-three basketball tournament in the world needs roughly 3,000 volunteers to make the event tick, but setting up the infrastructure takes far less —about 125 dedicated folks. 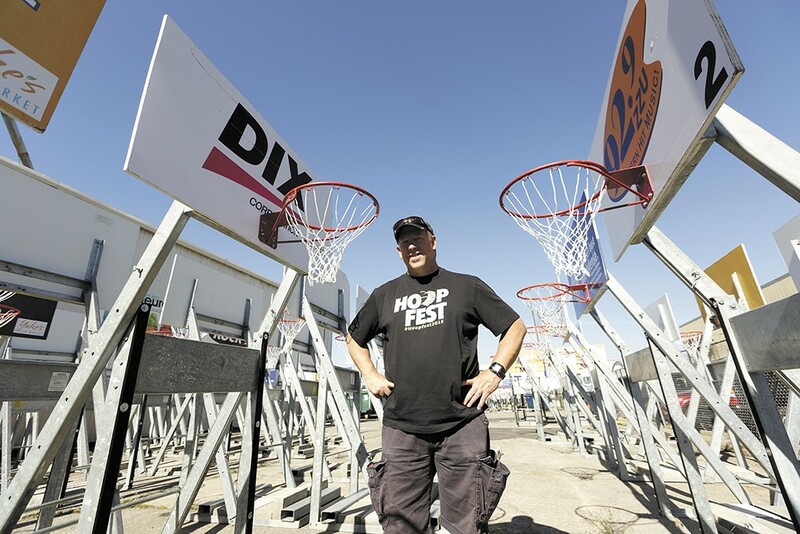 "From the guys that drive the trucks to bring in the stuff to the forklift drivers, a lot of those guys have been doing it for a long time, and the people who oversee them have been doing that for a long time," says Davis, Hoopfest site manager. The experience of the volunteers, coupled with Davis' exhaustive planning, allows for a rapid setup process. "We close the streets at 7 pm Friday night," Davis says. "They should pretty much have 461 courts built and taped by midnight." That's five hours, and there's a Shock game at Spokane Arena on Friday night, which prevents nearby courts from being built until 10 pm. Physically setting up the event takes place in an amazingly short period of time. But for Davis, the physical setup process began a few months back at a warehouse east of downtown. "I started in early April bringing the [baskets] out of the warehouse," Davis says. "Right now all of these baskets — and there are 25 semi-truck loads of baskets — are all staged in specific loads." Between the initial sorting of baskets into loads and actually loading them up onto the trucks, Davis had to make one very important group happy: the sponsors. All 461 of the backboards are emblazoned with a sponsor's logo. As it turns out, it's not easy being a backboard — and not just because their job is to get hit by flying basketballs. "A lot of the backboards have been damaged," Davis said. "So we have to take inventory and see how many are damaged. The ones that are damaged need to be redone. That takes all the way up through May." Then, on the Wednesday and Thursday before Hoopfest, those 25 semi-truck loads are moved into downtown. The baskets are unloaded at staging locations — parking meters or lots near their final court location. Davis and his crews divide the city center into four zones, each with between 115 and 120 courts. At each zone there is just one forklift. Markings along the curb, measured and set in advance to assure that the all courts fit, at the proper size, aid crews in placing the baskets and laying tape. One possible slowdown comes in the tape-laying process. Last year, rain caused a bit of a scare as wet streets initially prevented tape from sticking, but the volunteers got the job done and Hoopfest carried on. "Obviously we couldn't do this without the volunteers," Davis says. "Everybody who does this is a volunteer. There are only six full-time employees. It's that unique relationship that really sets this town apart for doing these kind of things." So it's not just meticulous planning by one of six full-time employees, coupled with a team of efficient volunteers. Spokane also helps set up Hoopfest.